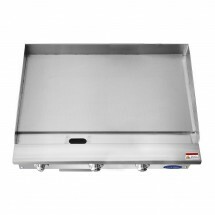 Atosa ATMG-36 Heavy Duty Manual Griddle, 36"
TigerChef > Restaurant Equipment > Countertop Cooking > Countertop Griddles >< Gas Griddles > Atosa ATMG-36 Heavy Duty Manual Griddle, 36"
$1,428.99 American Range AEMG-36 Countertop Gas Griddle 36"
Quickly and easily cook a variety of dishes with the Atosa ATMG-36 Heavy Duty Manual Griddle, 36". 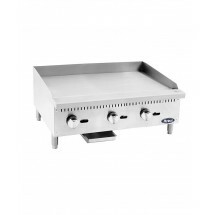 This griddle is equipped with 3 highly efficient burners and a thick radiant plate that heats quickly and evenly. 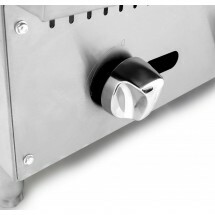 Thanks to independent manual controls, you can easily set each side of this griddle for conserving energy. Made from stainless steel, this unit is corrosion-resistant, exceptionally durable and easy to clean and maintain. 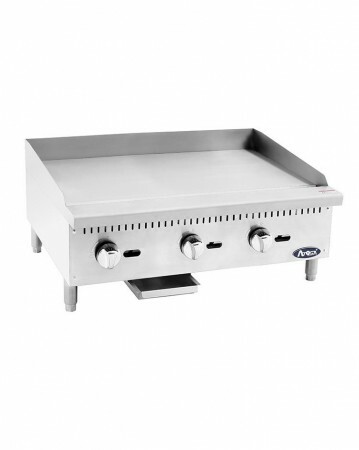 Perfect for concession stands or food service venues, this manual griddle has a simple and reasonable structure and adjustable legs for stability.